Covering 3300 acres Sherwood Pines Forest Park is a great venue for many activities. The cycling facilities provide something for every one, from family cyclists to experienced off-road riders. The way marked walking trails meander through some of the oldest parts of the forest. There are also many other tracks and trails to be explored. Walkers can find peaceful walks amongst the trees, walk to the far south of the park and you are unlikely to met anyone on the quiet forest tracks. There are several play areas to entertain the kids of all ages and the ‘Forest Lawns’ for running around and playing games. The visitor area has a cafe, toilets, Sherwood Pines cycle hire. You can also Go Ape! and have some fun in the forest at the UK’s No.1 Tree Top Adventure. Now with a bridleway links to Rufford Abbey Country Park, Sherwood Forest Country Park and Vicar Water Country Park you can make a day of it by cycling round all four. For a break based on Sherwood Pines try the Sherwood Forest Log Cabins in the park or Center Parcs on its eastern boundary. Don’t get lost! 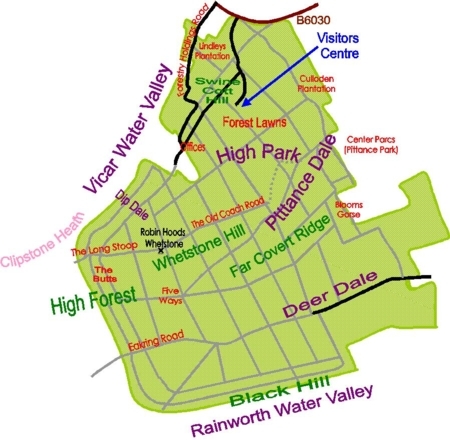 It would be worth printing of a copy of the Sherwood Pines basic map showing the forest tracks .